The Small Joys of Winter - How a kid surprises you with his thinking! It’s the 1st day of the New Year; a holiday that we spent snuggling inside the newly fluffed blankets. A lazy start to the New Year and as a family we loved it!! By the evening the temperature dipped and our heater worked overtime to keep us warm. But what really warmed me was this little scene right before we kissed good night. Scene – It’s 11 pm. Nanny maashi can be heard snoring in the background… now soft, then loud. Maa and Appa are tired after a long day of non-activity and have the sleep angels hovering over their head. V however is at his active best. Now twisting, now playing and now fretting he wants to be the cynosure. And he is that without much effort. Maa – Let’s go to sleep baby! It’s so cold… whoo-whoo (she whistles stretching her hands out to the heater). Let’s get rid-off your socks now. We’ll wear them in the morning. She tugs at V’s socks. He’s wearing two socks for effect. V watches his feet very closely as his mother pulls out one sock at a time. He wriggles his tiny, baby toes and picks up his socks. Appa – Where are your socks baby? Appa – Look baby… (pulling out his feet out of the blanket) Appa doesn’t have socks!! V looks at his own socks. Appa – And I feel so cold without socks V! V looks at his Daddy’s naked feet and looks back at his own socks. After a fraction of thought he extends his baby hands to his father. He gives him his booties. Appa (with a voice all warm) – You want me to wear your socks, beta? Appa pretends to wear his son’s booties. He caps his toes with them. That’s all they fit! Appa – Look V…they look so good! Thank you baby! I love you! V looks visibly pleased looking at his father’s feet. Appa – But V…what will I do tomorrow? 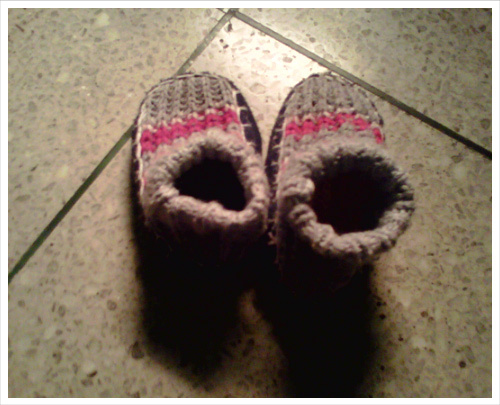 When you will wear these booties again? V looks about. Undecided. Yes…that’ll be a problem. He spots his red sandals near the dressing table. He climbs over his father and gets off the bed. Gingerly he walks to the table, picks up the sandals and turns them to his father triumphantly! “Look what I found Appa!” those twinkling eyes say it all! Appa (looking at Maa and with utter disbelief in his voice) – Did you just see that? My son is still a man of few words…and yes…he started to walk! 🙂 I taught him what it means to feel cold. But who taught him the rest of the things? Who taught him to share? Who taught him to ‘feel’ for his father? Who taught him to think of alternatives? And who taught him that doing these little things actually for another actually makes you feel good? I didn’t teach him these. Neither did his father. A silent ‘thank you’ to whoever taught him these finer things in life. My son showed the first signs of caring…the memory of which will warm me for all the cold nights ahead in my life. And I couldn’t have asked for a better beginning to the New Year.